Become an Active-level FFRC member and save 15% on your session! The patented and proven NormaTec Recovery system uses compressed air to massage your legs, mobilize fluid, and speed recovery. 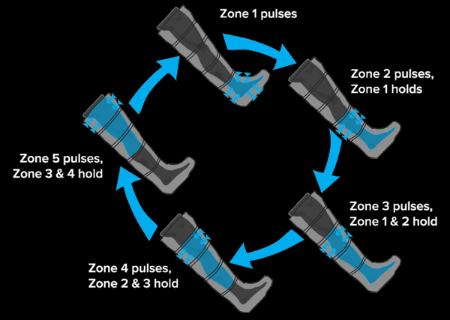 Each session involves a pre-inflate cycle, during which the connected attachments are molded to your exact body shape. The treatment cycle then begins by compressing your feet and legs in a pulsing fashion, starting with your feet and moving up your legs, massaging the muscles and mobilizing fluid. Following hard workouts, the result is often both reduced soreness and a shorter recovery time before your legs are ready for another hard effort. Where, When, and How Much? Normatec Recovery Sessions are hosted at Fleet Feet Des Peres and are available on a walk-in, first-come, first-served basis. Both leg massage and hip massage options are available. The cost is $10 for a 15-minute massage. Active-level FFRC members save 15% on all FFRC services.